Is your website or software product the best in the market? Are your competitors thinking of improvising their products based on yours? Can your product become number 1 in a very less time? These are some questions that hover the mind of the owner of a website, software application or any desktop application. And the answers to these questions simply lie in one fact: receiving constant customer feedback to make changes to the product and to know the exact position of your product in the market. This is when BetaEasy pitches in. How it works in case you are the owner of a website or online software application? BetaEasy helps you by thoroughly testing your web application, thereby enabling you to receive real-time feedback from the users of the application. This helps you to check whether your website meets all the requirements of the end users, easy to navigate, and most importantly user-friendly. Thus, using this customer feedback service, it becomes very easy for you to get real-time information about the drawbacks in your product and helps you to set priorities for website improvement and optimization. 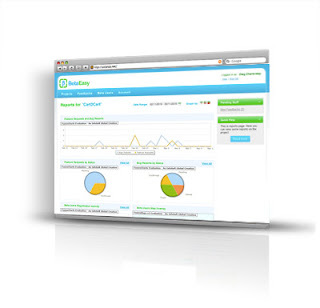 And the most interesting point is that all it takes just three simple steps with BetaEasy: first you need to insert the feedback form in your website or web application, then send invitations to the users of the application and manage the users, and finally analyze the feedback submitted by those users on a regular basis. How BetaEasy works in case you are the owner of a desktop application? In this case as well, this online service helps you with a thorough software testing that enables you to receive real-time feedback from the users of the application. This gives you an insight into whether your software desktop application is easy for a user to set up and use and whether the application meets set expectations and requirements of the users. User feedback collected through this way is easier to collate and comprehend, thereby letting you know the drawbacks in the application, if any, and helps you to devise strategies let the performance of your application improve. This tool also takes just three simple steps: first you need to insert the feedback form in your software desktop application, then send invitations to the users of the application and manage the users, and finally analyze the feedback submitted by those users regularly to make the product better and better. Thus you see how this easy-to-handle customer feedback service helps you in receiving timely feedback from all the potential users of your website or application and helps you in improvising and improving the performance of the application so that it is not sent at the back seat by competition, but witnesses a winning story always!